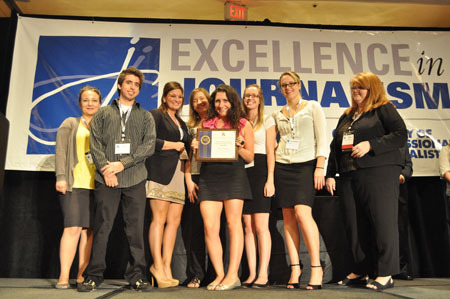 NEW ORLEANS — SPJ DePaul received the Society of Professional Journalists National Campus Chapter of the Year and Region 5 Campus Chapter of the Year awards this week at the Excellence in Journalism convention at the New Orleans Sheraton Hotel. The honors give SPJ DePaul three awards – one each at the national, regional and local levels – in its first full year of existence. In June, SPJ DePaul was named Most Outstanding Student Organization by DePaul’s Office of Student Affairs. SPJ DePaul was selected as the top student chapter in Region 5 (Illinois, Indiana and Kentucky) along with 11 other regional finalists. SPJ’s Vice President for Campus Chapter Affairs selects the winning national chapter from the 12 regional finalists. The SPJ awards cover work done during the 2010-11 academic year. The awards were based on programming and events such as freedom of information, diversity community service, ethics and project watchdog (journalism education). “DePaul presented cutting-edge programming, a successful membership recruiting campaign and strong communications within the chapter and beyond,” SPJ noted in its award announcement. Read the official SPJ press release. The chapter founded #spjchat, a Twitter chat held weekly during the academic year that explores issues in journalism. Guests have included Andy Carvin of NPR and Steve Buttry of Journal Register Company. The weekly chats drew up to 150 participants in some weeks. Students conducted interviews with journalists at the 2010 SPJ National Convention and produced a video about social media and issues in journalism. Students organized a panel discussion on diversity in media coverage with media members and other campus organizations, including the Korean Student Organization and Act Out. Read the story. Student members taught a social media seminar at Marist High School in the South Suburbs in December. Recruited 52 chapter members in its first year. Members of SPJ DePaul’s student executive board from the award-winning group are: President Nick Tarantino, Vice President Lauren Camplin, Secretary Meredith Gonsalves, Membership Coordinator Katie Karpowicz, Programming Coordinator Ali Trumbull, Events Coordinator Megan Bower and Publicity Coordinator Katie Rosebrock.